The Eastern Cape province is located in south-east central South Africa. It was established on 27 April 1994 and includes the southeastern part of the former Cape Province and the former homelands of Ciskei and Transkei. Its capital is Bhiso (formerly capital of the Ciskei). ARMS: Argent, between flanches Gules, in base bars gemelles wavy Azure and in chief a tree-aloe issuant Vert, with three racemes Gules; the shield ensigned of a leopard-skin head ring proper with a demi-sun issuant Or. The Free State province is located in central South Africa. It was established on 27 April 1994 and includes the former "Orange" Free State province, the homeland of Qwaqwa and the Thaba �Nchu area of the former Bophuthatswana. Its capital is Bloemfontein, also the judicial capital of South Africa. ARMS: Per chevron inverted, Or and Vert, the head of an Orange River Lily (Crinum bulbispermum) with three blossoms and four buds slipped proper and a chief dancetty, the peaks terminating in merlons, Azure; the shield ensigned of a circlet Or, embellished with representations of cut diamonds Argent, enamelled Azure against the upper and Vert against the lower facets, heightened of four heads of maize Argent, leaved Or, alternating with as many ears of wheat of the last. SPECIAL COMPARTMENT: A representation of the Free State plains proper. MOTTO: "KATLEHO KA KOPANO" (Success through Unity). 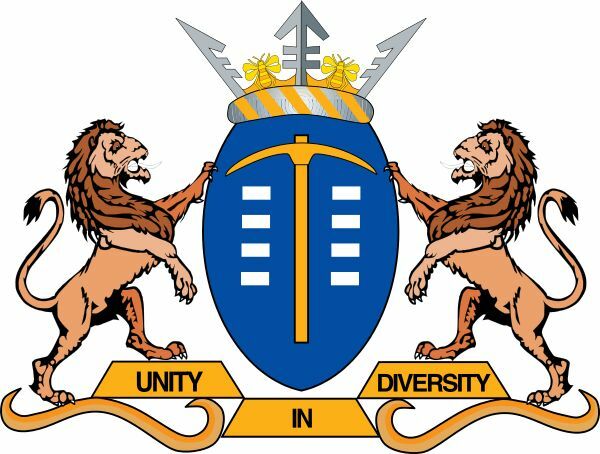 Gauteng (Sotho for "Place of Gold") province was established on 27 April 1994. It was previous part of the former Transvaal province and was initially called Pretoria-Witwatersrand-Vereeniging (PWV) until December 1994 when it was renamed Gauteng. It is the smallest province in terms of area but it nevertheless highly urbanized containing the country�s largest city, Johannesburg and administrative capital (Pretoria). Johannesburg is the provincial capital. KwaZulu-Natal is located on the eastern seaboard of South Africa. 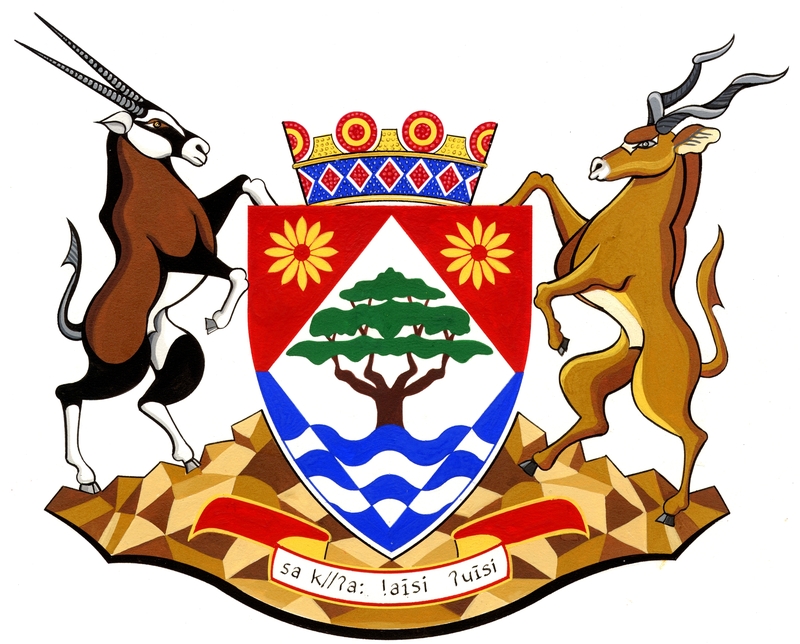 It was established on 27 April 1994 and includes the former province of Natal and the former homeland of KwaZulu. Its capital is located in Pietermaritzburg. MOTTO: "MASISUKUME SAKHE" (Let us Stand Up and Build). Mpumalanga (Where the sun rises) is located in north-east South Africa. 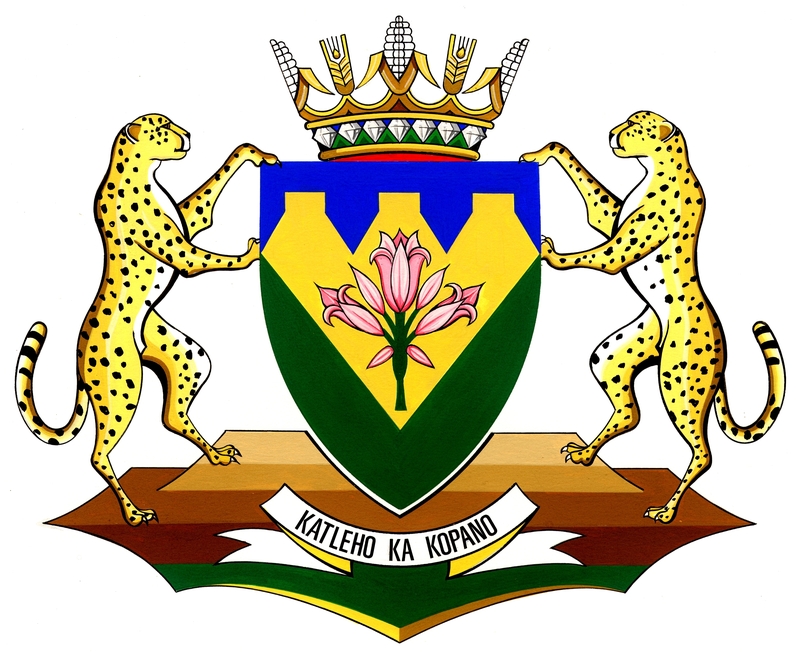 It was established on 27 April 1994 and comprises the eastern part of the former Transvaal together with the former homelands of KwaNdebele and KwaNgwane and parts of Bophuthatswana and Lebowa homelands. 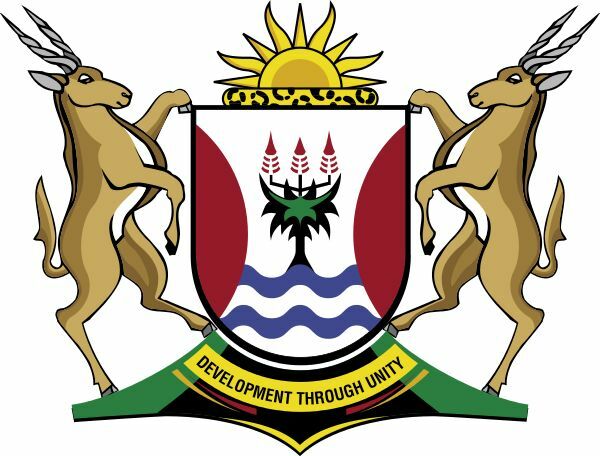 The provincial capital is located in Mbombela (formerly Nelspruit). MOTTO: "OMNIA LABOR VINCIT" (Work conquers all). 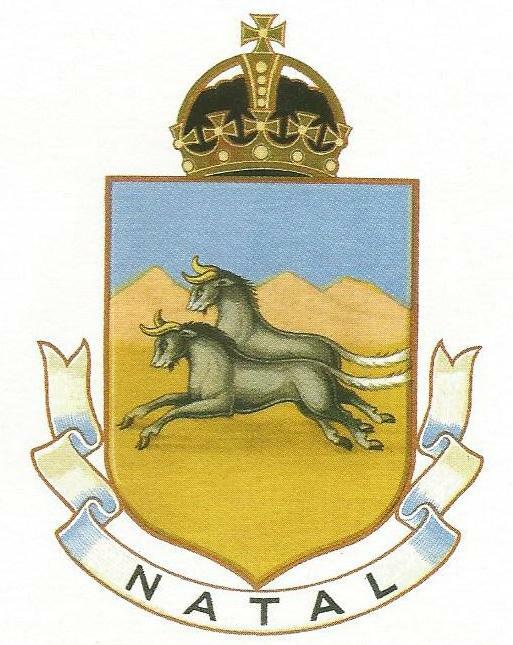 The Northern Cape is located in north-west South Africa and was formerly part of the Cape Province. It was established on 27 April 1994 and its capital is located in Kimberley. It is the largest province by area with the lowest population. ARMS: Per fess Gules and Azure, a lozenge Argent charged with a thorn tree proper, in base two barrulets wavy counter changed and in chief two daisies Or; the shield ensigned of a coronet comprising a circlet Or, embellished of Azure and lozengy Gules San beadwork, fimbriated Argent, heightened of six beadwork torteaux, each charged with an annulet of beadwork Or, there between as many merlons embowed of beadwork, also Or. SUPPORTERS: Dexter an oryx (Gazella dorcas) and sinister a kudu (Tragelaphus strepsiceros). SPECIAL COMPARTMENT: A rocky ground. MOTTO: "Sa //a !aisi 'uisi" (We go good life) in Auni, a San language from the Kalahari Gemsbok Park region of Gordonia. Limpopo Province is the northern most province of South Africa which was established on 27 April 1994 and includes parts of the former Transvaal and former Lebowa homeland and all of the former homelands of Venda and Gazankulu. Its capital is located in Polokowane (formerly Pietersburg). ARMS: Or, a baobab tree and a chief wavy, Vert; the shield ensigned of a circlet Or, heightened of eight cycad leaves supported by sets of buffalo horns, Argent. SPECIAL COMPARTMENT: An undulating compartment, Vert above and Sable below, the lower edge Or. MOTTO: "PEACE, UNITY AND PROSPERITY". 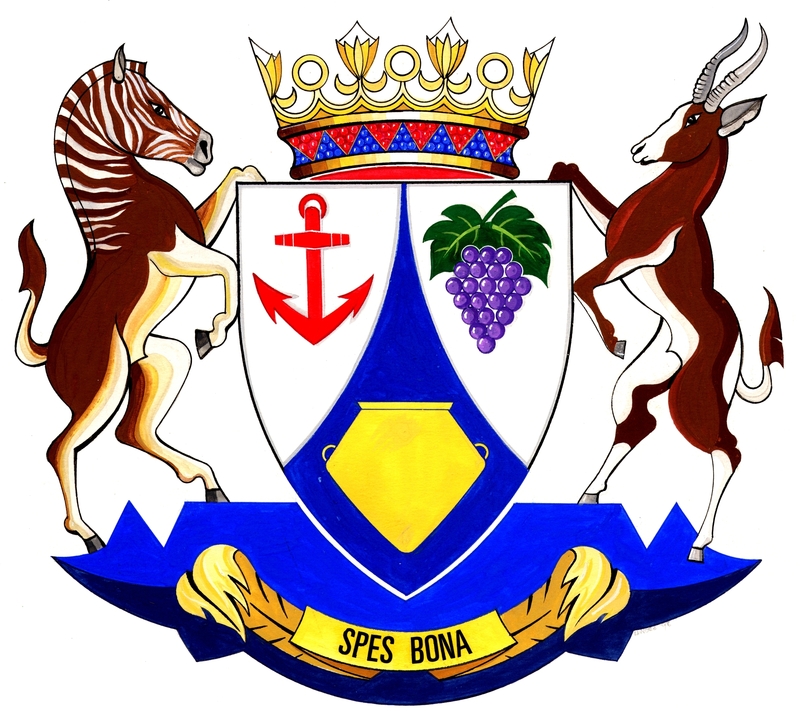 The North West Province was established on 27 April 1994 and comprises the western portion of the former Transvaal, the north eastern part of the former Cape Province and parts of the former Bophuthatswana homeland. Its capital is located in Mafikeng (formerly Mafeking). 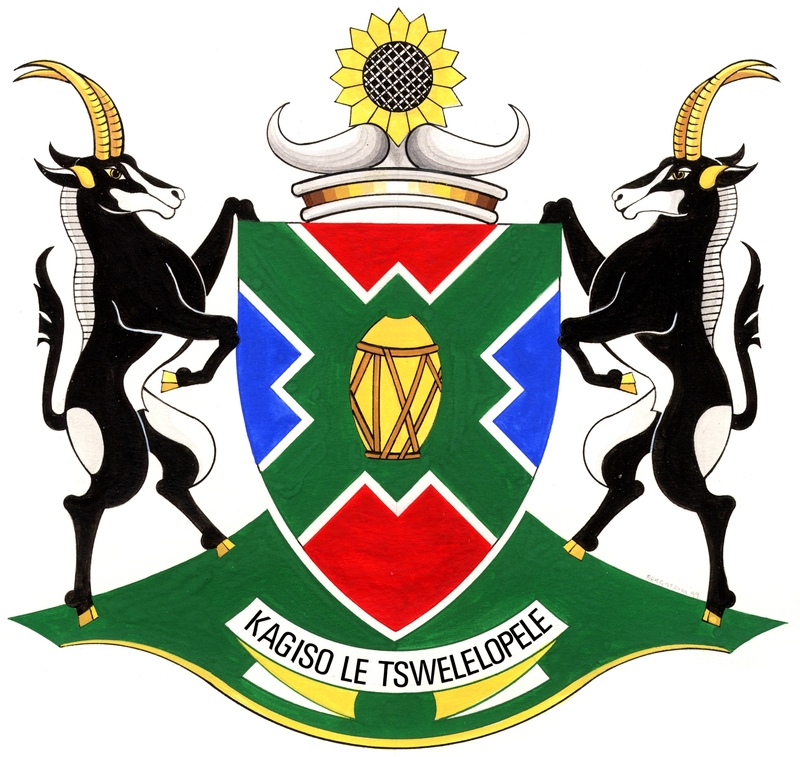 MOTTO: "KAGISO LE TSWELELOPELE" (Peace and prosperity). The Western Cape is located in south-west South Africa and was part of the former Cape Province. It was established on 27 April 1994. Its capital is in Cape Town, which is also the legislative capital of South Africa. ARMS: Argent, on a pile embowed inverted throughout Azure, a Khoi clay pot with a conical base and two horizontally pierced lugs, Or, between in chief dexter an anchor Gules and sinister a bunch of grapes slipped and leaved proper; the shield ensigned of a coronet comprising a circlet Or, embellished of beadwork indented Gules and Azure heightened of six protea flowers Or, seeded Argent alternating with as many annulets, Or. SUPPORTERS: Dexter a quagga (Equus quagga quagga) and sinister a bontebok (Damasileus dorcas dorcas) proper. SPECIAL COMPARTEMENT: A stylized representation of Table Mountain Azure, bearing a riband with the fold-backs in the form of two ostrich feathers, Or. MOTTO: "SPES BONA" (Good Hope). Commonly known as the Cape Province (Kaapprovinsie in Afrikaans), this was the largest of the former provinces of South Africa. It was previously a British colony which was preceded by an earlier Dutch colony of the same name which had been established in 1652 by the Dutch East India Company. The Dutch lost the colony to Britain following the 1795 Battle of Muizenberg, but had it returned following the 1802 Peace of Amiens. It was re-occupied by the British following the Battle of Blaauwberg in 1806, and British possession was affirmed with the Anglo-Dutch Treaty of 1814. The Cape Colony then remained part of the British Empire, becoming self-governing in 1872, before uniting with three other British colonies to form the Union of South Africa on 31 May 1910. With the establishment of the new political dispensation in South Africa on 27 April 1994, the Cape Province was partitioned into the Eastern Cape, Northern Cape, and Western Cape, and a smaller portion went to the North West Province. Natal, meaning "Christmas" in Portuguese because it was first reached by the Vasco da Gama expedition at that time of the year, was the smallest of the former provinces located on the north eastern coast of South Africa. After the British government annexed the Boer Republic of Natalia, it was proclaimed a British colony on 04 May 1843 and on 31 May 1910 it amalgamated with the three other British colonies to form the Union of South Africa. Within a Chippendale-type frame, a on plain, two Wildebeest in full course at random (to sinister), with the words COLONY OF NATAL beneath the frame. The frame itself is ensigned with the Royal Arms and around the circumference appears the legend VICTORIA DEI GRATIA BRITANNIAR. REG. F.D. Azure in front of mountains and on a plain two Black Wildebeesten in full course at random, all proper. ...the shield ensigned with a crown consisting of a circlet with eight crosses patt�e and four arches surmounted of a cross pattée Or, with a cap of estate Sable. 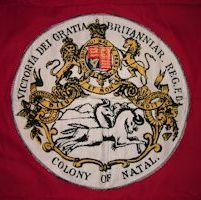 Although the word NATAL was added to the riband beneath the shield, this was not mentioned in the blazon. 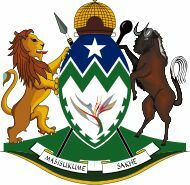 These Arms were in use until 26 April 1994, following which Natal, together with the former KwaZulu homeland, formed the KwaZulu-Natal province. 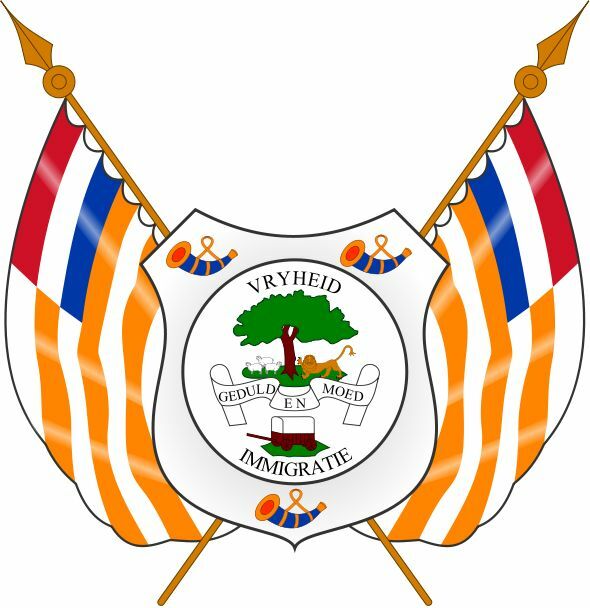 The Orange Free State (Oranje-Vrijstaat in Dutch and later Oranje-Vrystaat in Afrikaans) was an independent Boer sovereign republic during the second half of the 19th century, and later a British colony and a province of the Union of South Africa after 31 May 1910. It is the historical precursor to the present-day Free State province. Extending between the Orange and Vaal rivers, it was initially established during the Great Trek when the Voortrekkers left the Cape Colony in 1824 and moved into the hinterland of what is today South Africa. On a shield Argent, between three bugle horns Azure, garnished and stringed Gules, a representation of the seal of the Orange Free State Republic as adopted in 1856, viz on a white roundel, in chief a tree on an island, between dexter, three sheep and sinister, a natural lion supporting the tree with his dexter paw, in base a Voortrekker wagon on an island all proper; on a ribbon draped fesswise, the motto "GEDULD EN MOED" (patience and courage), above the tree the word VRYHEID (liberty) and below the wagon the word IMMIGRATIE (immigration); behind the shield on two staves with ball and spear points Or, two flags of the same Republic draped on both sides, each with seven stripes visible, alternatively white and orange and a canton of three stripes, red, white and blue. Argent on a Mound a Springbuck and on a Chief Azure the Imperial Crown all proper. The Orange River Colony amalgamated with the other British colonies to form the Union of South Africa on 31 May 1910 to become the Orange Free State province and later reverted back to using the previous republican arms on 25 May 1937. This was not without controversy, particularly around the identification of the �tree� which was not explicitly identified in the original blazon. The wild olive was later adopted as the provincial tree! In 1954 the original Royal Warrant was withdrawn and in 1955 the Orange Free State applied to have its arms, as they had been borne since 1937, recorded in the (London) College of Arms. 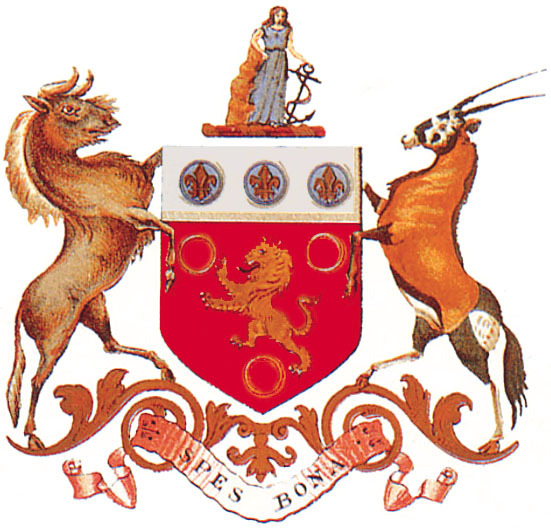 These arms were later registered with the South African Bureau of Heraldry on 30 October 1967 and remained in use until 27 April 1994, when the Orange Free State became the Free State Province. On a silver field there shall be placed a Wagon and a Golden Anchor, while an Eagle shall rest upon the Arms. On the right hand side of the Arms a Man in national costume, armed with a gun and accessories. On the left hand side a lion. During the British annexation of the ZAR between 1877 and 1881, the British Royal Arms were used. 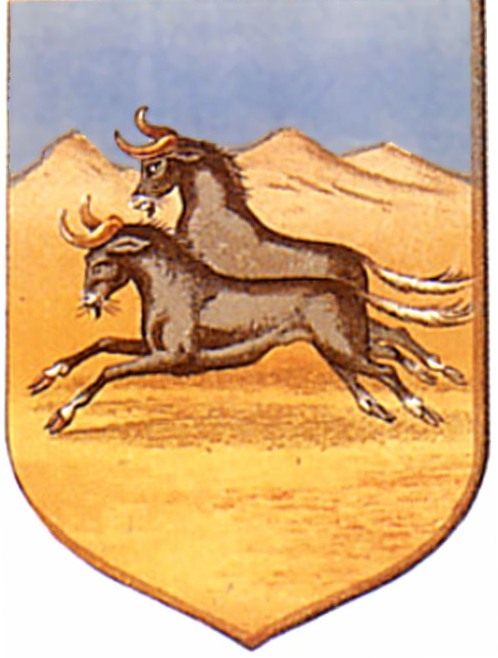 Following the formal recognition of the ZAR�s independence in 1881, its arms were restored, with many renditions appearing. The ZAR came to an end on 31 May 1902 with the Treaty of the Peace of Vereeniging which signaled the end of the Anglo-Boer War. In its place was established the British controlled Transvaal Colony. 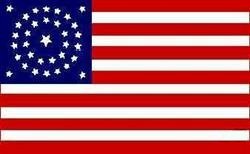 The first colonial device used was the King Edward Great Seal similar in design to the first Great Seal of the Union of South Africa but with the words THE TRANSVAAL at the bottom of the rim. The same legend, except for the name of the colony, was used on the Great Seals of the Cape, Natal and Orange River Colonies. 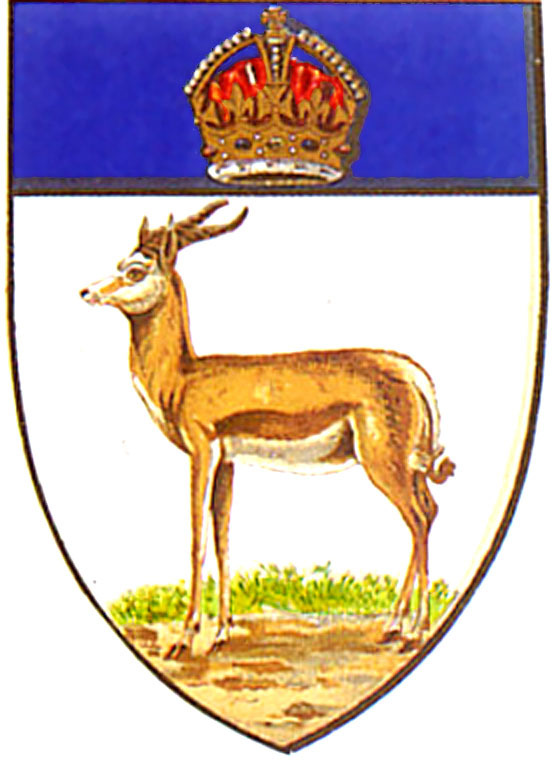 No formal arms were used by the Colony, which was incorporated into the Union of South Africa on 31 May 1910 as the province of the Transvaal. 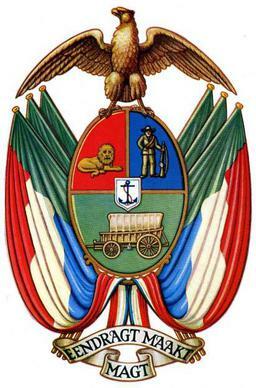 Arms: An oval shield per fess, the chief divided per pale: dexter Gules, a natural lion contourne couchant gardant Or; sinister Azure, a bearded man in national dress wearing a hat and a bandolier, and holding in his left hand a gun resting upon the ground; in base Vert, a Voortrekker wagon proper. On an inescutcheon Argent an anchor Sable cabled Gules. Perched on the shield an eagle displayed Or. Behind the shield and draped below on both sides three flags of the South African Republic, green, red, white and blue. 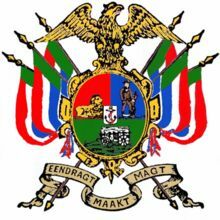 Motto: "EENDRACHT MAAKT MAGT" (Unity is Strength). 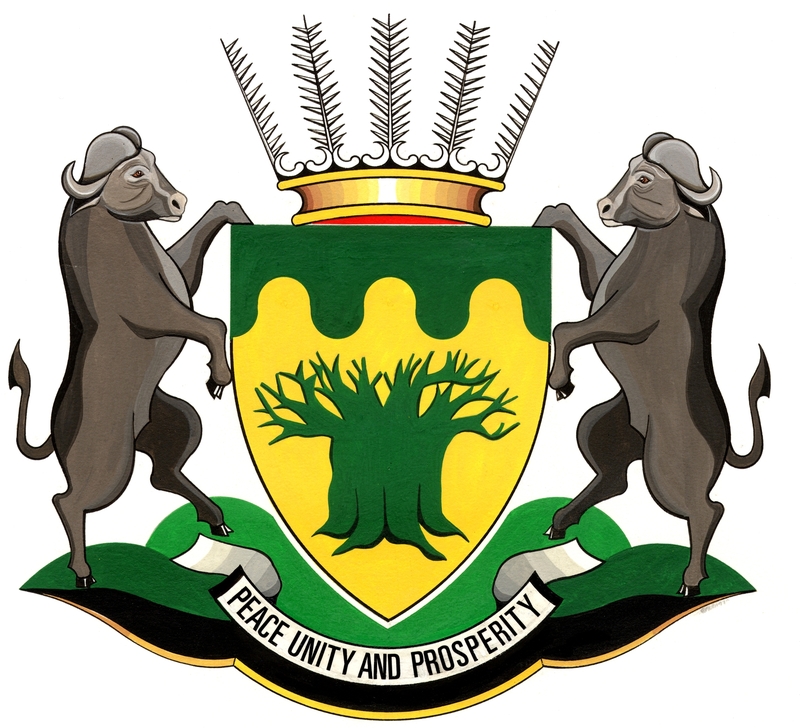 These arms were used until 26 April 1994, after which the Transvaal was divided into the Gauteng, Mpumalanga, Limpopo and North West provinces in the new political dispensation in South Africa.